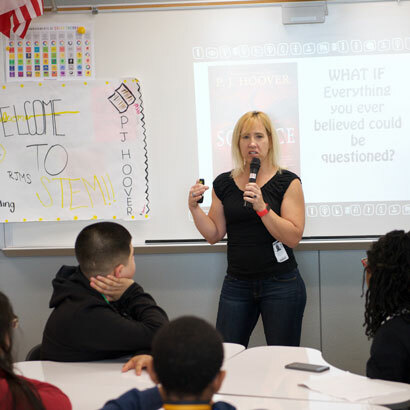 At Smith Middle School, two authors and an illustrator urged students to tap into their imaginations and ask themselves “what if” questions when laboring to write creatively. Authors P.J. 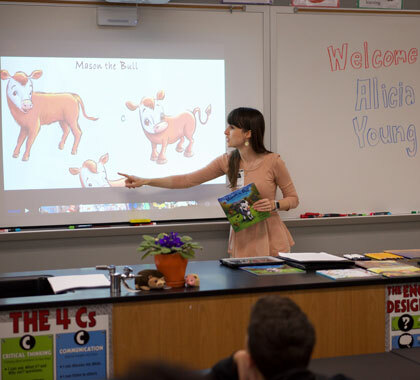 Hoover and Nikki Loftin and illustrator Alicia Young, all from the Austin area, provided workshops for seventh-graders Wednesday, encouraging students to see the written word differently. The three artists also shared work interests and experiences, showing there are career options for those who embrace literary skills and that the field draws a variety of people. 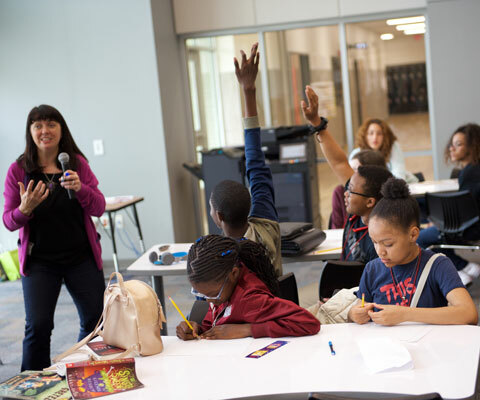 Seventh-grade English teacher Katie Drake said she’s seen students in the school’s STEM Academy gain confidence as writers, sharing their own poetry and fiction. The guests, she said, gave students an extra dose of inspiration to persevere even when an essay assignment or state-mandated test seems daunting. Texas STAAR testing scheduled the second week of April includes writing for seventh-graders and math and reading for eighth-graders. Hoover, author of the popular novel Solstice, told the Greek myth of Persephone, kidnapped and dragged to the underworld and said she wondered what would have happened if the daughter of Zeus was a modern teenager. The Austin-based author said she spent most of her childhood as a happy reader, never expecting to write for a living, but that the movie Star Wars triggered an interest in fantasy and science fiction that set her on her own literary path. Young, a children’s book illustrator, shared several drawings, explaining how she works with authors to bring to life themes through color, design, facial expression and other elements. Loftin, a prolific youth author known for short “flash fiction” guided students to take simple prompts and build characters and narratives through asking searching questions. She said fiction writers should be wary of being too certain of a story ending, as a creative narrative takes on a life of its own. “They have all the tools they need in their imagination and in the skills they have learned in school,” Loftin said, explaining her goals in the middle school workshop. She shared with students that when she was in high school, she recognized her unusual skill and interest in writing. Following the advice of a librarian, she penned an essay about electrical safety that led to one of many college scholarships. The writer urged students to seek out contests and scholarships that call on creative writing and to lean on teachers and librarians to proofread their work. She also warned them to avoid copying ideas they have seen in books, movies and online media.